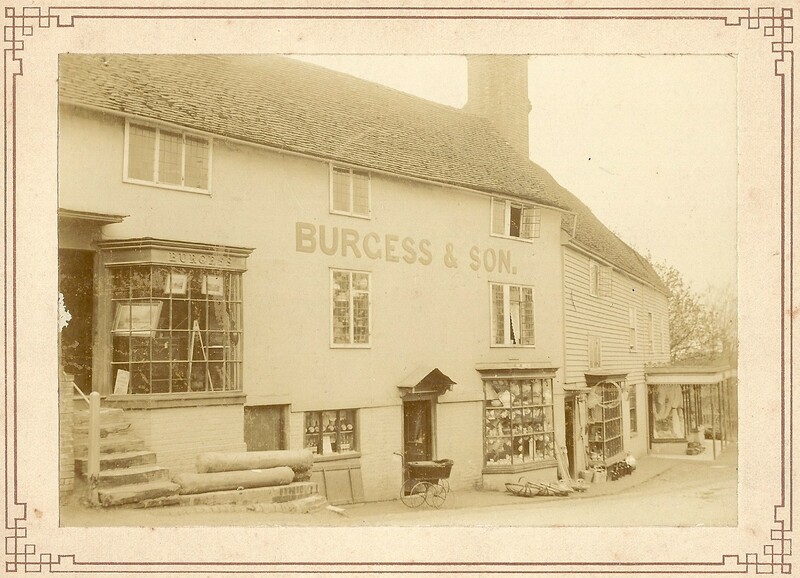 In 1831 William Burgess became the owner of a shop in Goudhurst which was to bear his family name from that date until 2012. Burgess married Anne Gilbert in about 1834 and it was her father and brother, both named John, who were the original owners of the business. A stock book dating from 1832 shows that the shop sold fabric and clothing, such as muslin and, serge, caps and hats, lace collars and edging, as well as some earthenware, candles, shoes and sundry items. The total value of the stock was £502. In 1858 William’s son, William Chester Burgess, was taken in to partnership, followed by his son, Frank in 1884 and so on down the generations until the Burgess family sold the shop in 1971. New owners took over the shop in 2012 and immediately renamed it Goudhurst Village Store. It closed for a few months in 2015, before it was re-opened under new ownership in November 2015. The official re-opening took place in February 2016 when the shop once more became “Burgess Stores”. 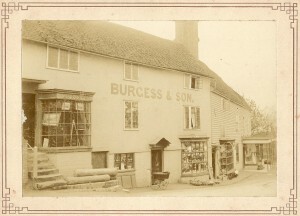 The original shop was in the same premises as it occupies today, on the corner of the crossroads in the centre of the village. However at one time it also occupied many of the buildings next to it moving up the High Street towards the church. Originally this “top” part was leased, but on the death of the original owner, William Chester Burgess was able to purchase these additional premises in 1869. As a grocer and draper the shop employed a number of male apprentices who wished to learn the trade. Surviving apprenticeship indentures show that this was typically a two or three year apprenticeship in which the person concerned was paid a nominal sum (or nothing at all) per week for the first year which rose in subsequent years until the apprenticeship ended.